Wiki New Zealand — open data site, and check out the chart builder behind the scenes for importing the data. It’s magic. stenographer (Google) — open source packet dumper for capturing data during intrusions. Which GPU for Deep Learning? — a lot of numbers. Overall, I think memory size is overrated. You can nicely gain some speedups if you have very large memory, but these speedups are rather small. I would say that GPU clusters are nice to have, but that they cause more overhead than the accelerate progress; a single 12GB GPU will last you for 3-6 years; a 6GB GPU is plenty for now; a 4GB GPU is good but might be limiting on some problems; and a 3GB GPU will be fine for most research that looks into new architectures. 23andMe Wins FDA Approval for First Genetic Test — as they re-enter the market after FDA power play around approval (yes, I know: one company’s power play is another company’s flouting of safeguards designed to protect a vulnerable public). The O'Reilly Radar Podcast: Balaji Srinivasan on the bigger picture of bitcoin, liquid markets, and the future of regulation. The promise of bitcoin and blockchain extends well beyond its potential disruption as a currency. In this Radar Podcast episode, Balaji Srinivasan, a general partner at Andreessen Horowitz, explains how bitcoin is an enabling technology and why it’s like the Internet, in that “bitcoin will do for value transfer what the Internet did for communication — make it programmable.” I met up with Srinivasan at our recent O’Reilly Radar Summit: Bitcoin & the Blockchain, where he was speaking — you can see his talk, and all the others from the event, in the complete video compilation now available. “Bitcoin is a platform for programmable money, programmable interchange, or anything of value. That’s very general. People have probably heard at this point about how you can use a blockchain to trade — in theory — stocks, or houses, or other kinds of things, but programmable value transfer is even bigger than just trading things which we know already exist. FCC Chairman Wheeler Proposes New Rules for Protecting the Open Internet (PDF) — America may yet have freedom. No blocking, no throttling, no paid prioritisation. The Future of College (Bill Gates) — The MOOC, by itself, doesn’t really change things, except for the very most motivated student. HALLELUJAH! The evolving marketplace is making new data applications and interactions possible. 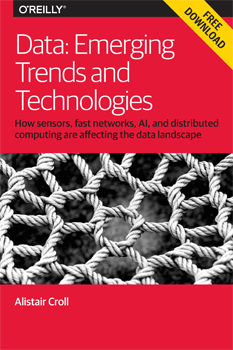 Editor’s note: this is an excerpt from our new report Data: Emerging Trends and Technologies, by Alistair Croll. Download the free report here. Here’s a look at some options in the evolving, maturing marketplace of big data components that are making the new applications and interactions we’ve been looking at possible. First used in social network analysis, graph theory is finding more and more homes in research and business. Machine learning systems can scale up fast with tools like Parameter Server, and the TitanDB project means developers have a robust set of tools to use. Are graphs poised to take their place alongside relational database management systems (RDBMS), object storage, and other fundamental data building blocks? What are the new applications for such tools? Inside the black box of algorithms: whither regulation? It’s possible for a machine to create an algorithm no human can understand. Evolutionary approaches to algorithmic optimization can result in inscrutable, yet demonstrably better, computational solutions. If you’re a regulated bank, you need to share your algorithms with regulators. But if you’re a private trader, you’re under no such constraints. And having to explain your algorithms limits how you can generate them. As more and more of our lives are governed by code that decides what’s best for us, replacing laws, actuarial tables, personal trainers, and personal shoppers, oversight means opening up the black box of algorithms so they can be regulated. Infrastructure for Data Streams — describing the high-volume log data use case for Apache Kafka, and how it plays out in storage and infrastructure. Obama: Treat Broadband and Mobile as Utility (Ars Technica) — In short, Obama is siding with consumer advocates who have lobbied for months in favor of reclassification while the telecommunications industry lobbied against it. MozVR — a website, and the tools that made it, designed to be seen through the Oculus Rift. All Cameras are Police Cameras (James Bridle) — how the slippery slope is ridden: When the Wall was initially constructed, the public were informed that this [automatic license plate recognition] data would only be held, and regularly purged, by Transport for London, who oversee traffic matters in the city. However, within less than five years, the Home Secretary gave the Metropolitan Police full access to this system, which allowed them to take a complete copy of the data produced by the system. This permission to access the data was granted to the Police on the sole condition that they only used it when National Security was under threat. But since the data was now in their possession, the Police reclassified it as “Crime” data and now use it for general policing matters, despite the wording of the original permission. As this data is not considered to be “personal data” within the definition of the law, the Police are under no obligation to destroy it, and may retain their ongoing record of all vehicle movements within the city for as long as they desire. Twitter Open Sources Their Emoji Library — Emoji are the sparklines of sentiment. Interactive 360-degree Films. From Google (Medium) — you move the camera through a movie shot in 360 degrees, and can choose what you’re looking at through the scene. I can’t wait to try this, it sounds brilliant. Bitcoin Crackdown — everyone who started exchanges and mutual funds thinking Bitcoin wouldn’t be regulated like a currency is getting an SEC headache. Connected Choices: How the Internet is Challenging Sovereign Decisions (PDF) — Ultimately, the Internet remains both a global commons and part of each nation’s sovereign infrastructure, and thus activities in cyberspace must continue to navigate two sets of demands: national interests and global interests. […] Political leaders are responsible for articulating a vision and establishing general principles and policies to achieve their goals and, accordingly, are constantly trying to advance their agendas using policy, law, market mechanisms, regulation, standards, and other initiatives. The evidence is clear; you just have to look for it.